Fish and mushrooms can be dredged in the same batter and deep-fired in oil. 2 Can You Cook Fish Without Batter? 4 Can I Fry Tilapia Without Batter? Dredging fish and mushrooms in a tasty batter makes the difference between crispy and palatable pub grub, and lackluster fried food. Non-alcoholic beer and tempura batters provide coatings for fish and vegetables before frying them in hot oil. With this advantage in mind, you can create one batter to make two dishes, saving time and ingredients. Pour 2 cups of flour, 1 tbsp. baking soda, 1 tsp. salt and 1 tsp. pepper in a mixing bowl. Add more spices such as garlic powder or paprika, if desired. Mix the dry ingredients with a whisk. Whisk one egg with one can of soda water together in a separate bowl to make a non-alcoholic batter. 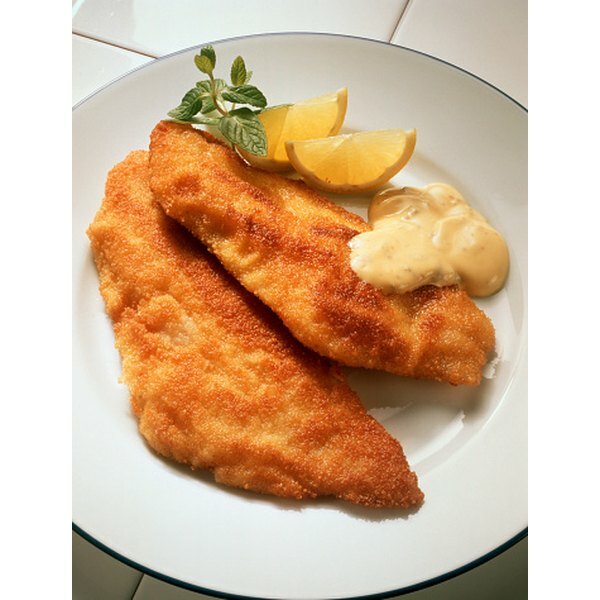 Substitute the egg and soda water for one bottle of brown beer to create a beer batter. Pour the mixture or brown beer into the mixing bowl. Whisk the dry and wet ingredients until it is a smooth consistency and is absent of lumps. Whisk the ingredients until the batter is a smooth consistency, absent of lumps. Stir 2 cups of rice flour, 1 tsp. of salt and 1 tsp. of pepper in a mixing bowl. Beat two egg yolks in a separate bowl with a whisk. Add the beaten egg yolk to the mixing bowl and whisk the ingredients. Pour 1 cup of cold water into the mixing bowl and stir the ingredients until the batter develops a smooth texture.